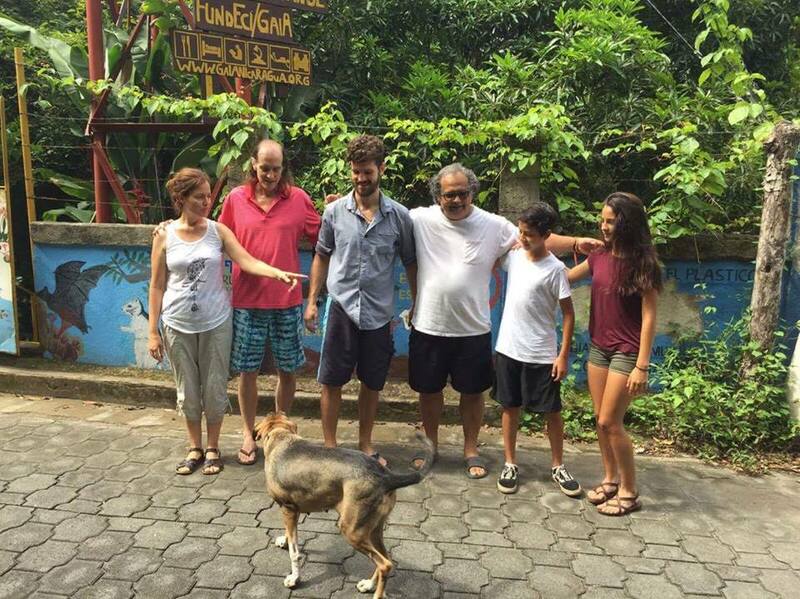 Every day brings something new to us at Estacion Biologica Laguna de Apoyo. 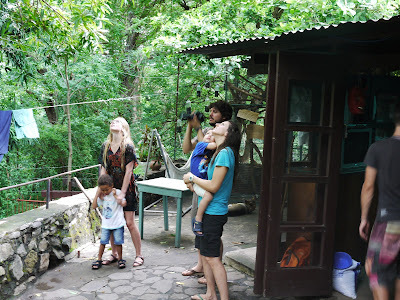 Observations of flora and fauna, studies being conducted, scuba diving, cultural activities. People teaching, and others learning, Spanish, culture, biodiversity, the environment, volunteering. New friends are made easily, because we are small and we share with people who visit. 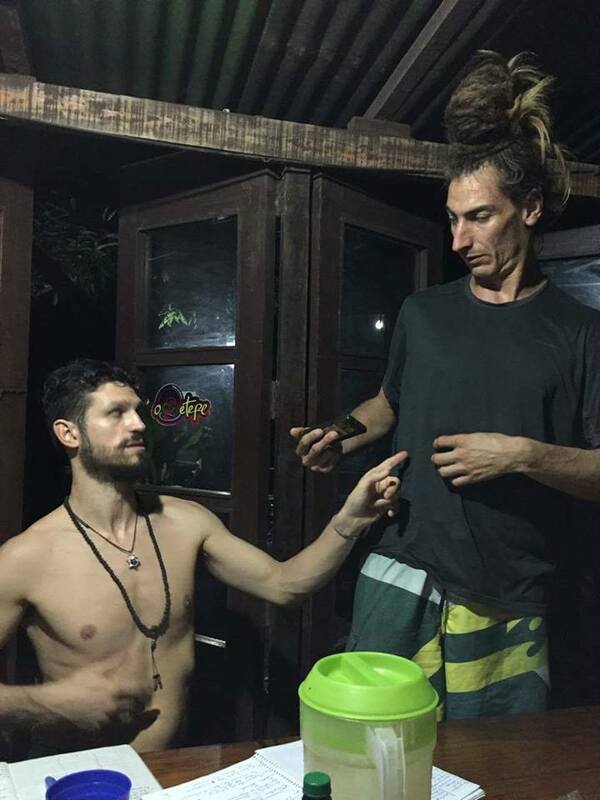 People come and go, from Nicaragua and beyond. Some to learn, others to give. Everyone ends up doing a little of both. Bella, our faithful canine, hangs with the gang in front of Estacion Biologica Laguna de Apoyo. Foto Jeffrey McCrary. Estacion Biologica is not at all pretentious or upscale. 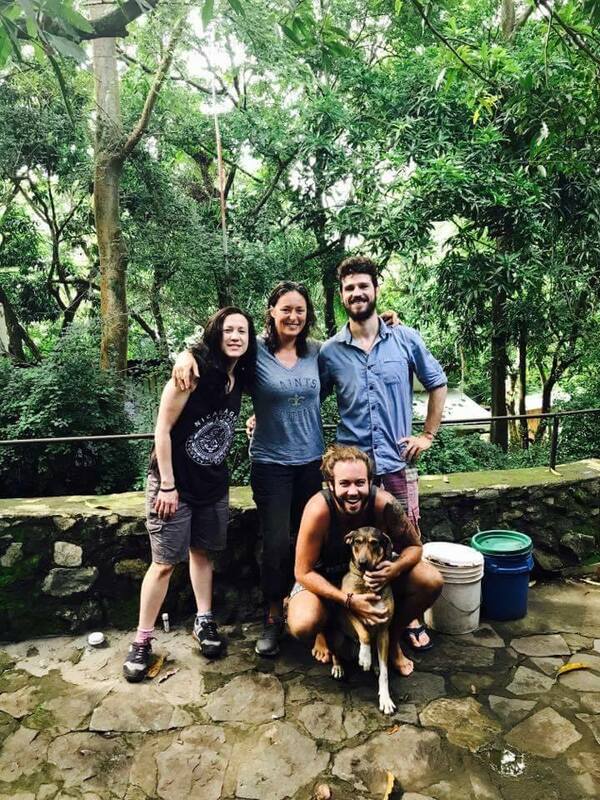 We have a simple place, and we are doing simple things: planting trees, studying the environment, birdwatching, sharing our knowledge of the language and culture, and collaborating with the neighbors and the government of Nicaragua to make Laguna de Apoyo Nature Reserve a great place for nature, for decades to come. Our visitors are welcome to pitch in. Our prices are very low, but we are comfortable, and we eat very well! Special food options can always be arranged: gluten- or dairy-free, vegetarian, or vegan. This is how Spanish homework ends some evenings. Photo Andras Dorgai. We are perhaps best known in some circles for the Spanish courses we offer, at Apoyo Spanish School. Each year, we impart at least one hundred fifty course units of a week each, custom-designed to fit the abilities and needs of each person. Our students are often travels who want to engage with locals better. Many, however, are learning Spanish for professional reasons, using their language skills in Nicaragua or other nearby countries in their jobs. 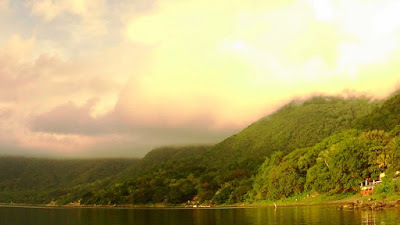 Early morning in Lake Apoyo, while clouds cover Pacaya, above the rim of the crater. Photo Andras Dorgai. Undoubtedly, the best part of spending time at Estacion Biologica Laguna de Apoyo is the lake. Mornings, the lake can be calm and smooth as glass, without a soul to be seen near the water. As the day progresses, however, locals and tourists may come for a dip. 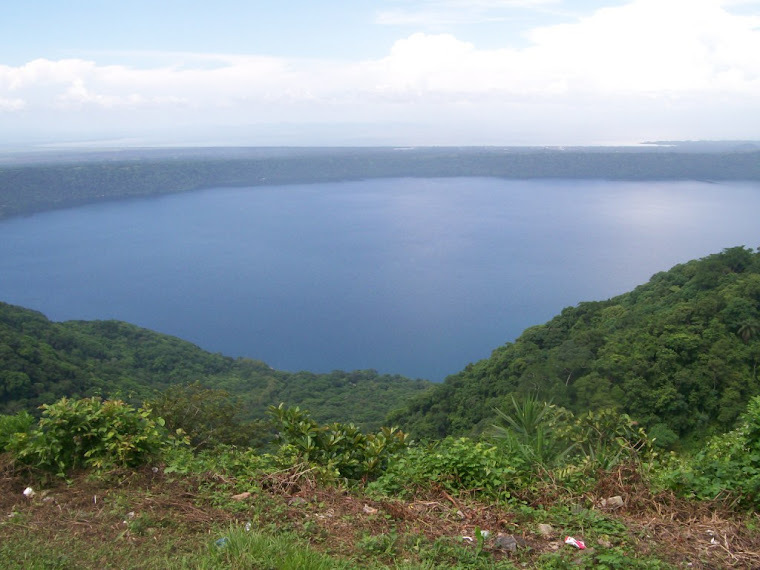 There is no water body anywhere that is as comfortable and naturally clean as Laguna de Apoyo, for a great swim. Visibility underwater during a scuba dive may be as much as 10 meters on a calm day. All ages get involved when monkeys are to be seen. Everyone becomes a kid again! Photo Jeffrey McCrary. Our property at Estacion Biologica is humble, but blessed with great trees and often with lovely wild animals. Golden-mantled howler monkeys, known locally as mono congo, are over our heads these days, perhaps two hundred days each year. We thank effective conservation policies enacted as part of the management plan that our director, Jeffrey McCrary, coordinated for the Ministry of the Environment and Natural Resources. Several years ago, there were fewer monkeys and they were found in more limited locations than currently. Apoyo Spanish School students gather for some extra tutoring from Bela. Photo Andras Dorgai. 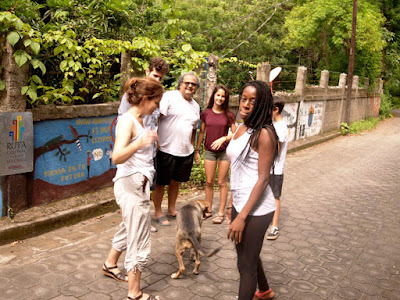 Volunteers come to Estacion Biologica to participate in specific projects, or in whatever is most needed. One example is the Murrieta family, who recently spent a couple of weeks engaged in all kinds of environmental conservation activities, including the planting of 56 new trees in a reforestation plot in the hillside behind Estacion Biologica. The evenings were filled with discussions ranging from poetry and literature, to politics and saving the environment, to our favorite places in the many cities each of us had lived or visited. Visits to Estacion Biologica are often a family affair. Photo Jeffrey McCrary. Each day at Estacion Biologica brings a new, unexpected blessing. The people in these photos are just a sampling of the blessings that have come our way in the most recent months. We are grateful for every hand lent and each voice raised. Please come by or write us!